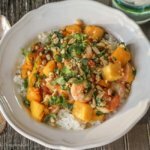 Thai Inspired Stir Fried Shrimp and Mango is the perfect dish for after the holidays (or on any busy weeknight): fast, easy, healthy and delicious. While you’re reading this I will hopefully be swimming in the Caribbean somewhere, recharging from Holiday craziness and getting a little sun to see me through the Pittsburgh winter. 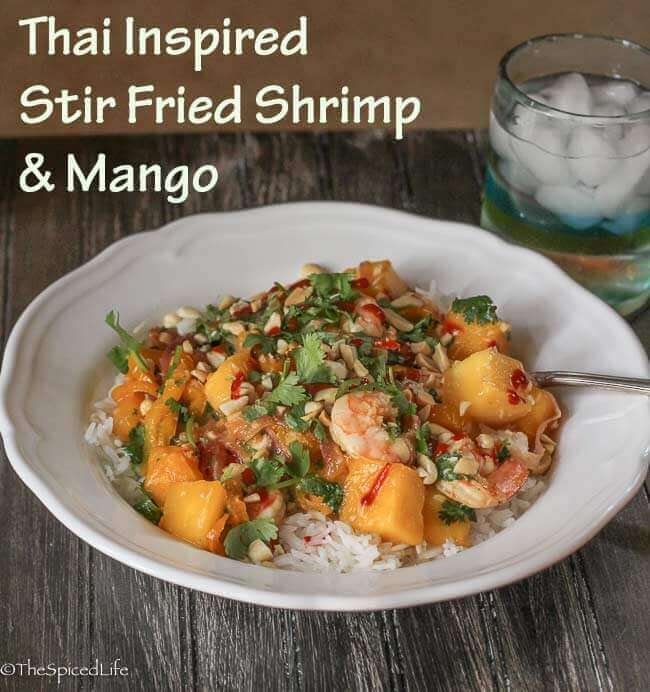 I actually made this Thai Inspired Stir Fried Shrimp and Mango back in…September? I no longer remember, I just know when its turn came up in my rotation, I realized it was the perfect dish to share while I was incommunicado because it is the perfect dish for after the holidays. 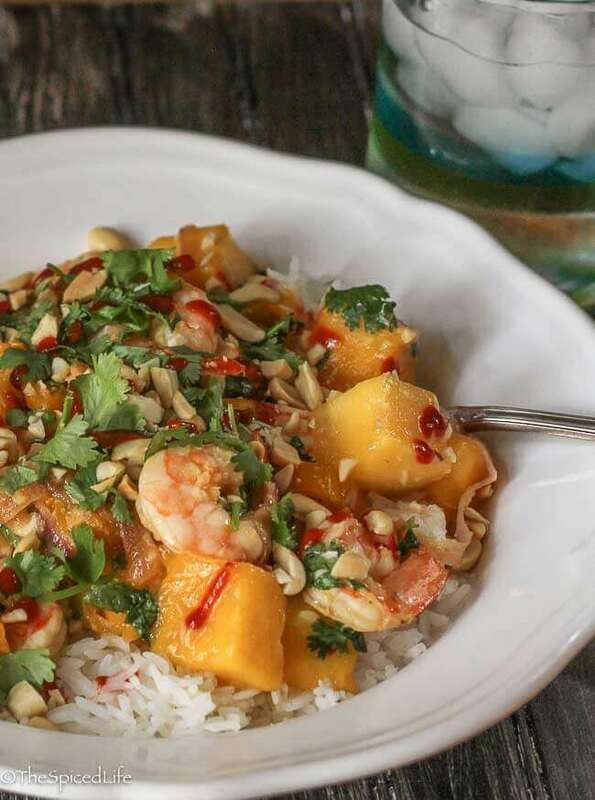 So what makes Thai Inspired Stir Fried Shrimp and Mango so perfect starting in early January? Three words my friend: fast, healthy and frozen. 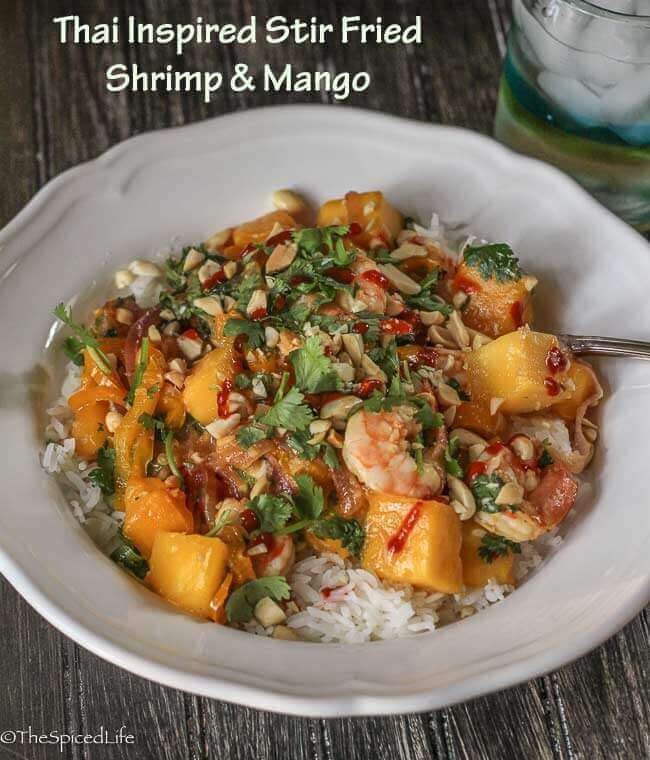 OK that last word needs some explanation–but if you keep flash frozen shrimp and frozen mango chunks in your freezer, all this dish needs is limes, onion and garlic–pantry staples–and small, slender sweet (or hot) peppers and some fresh herb (Thai basil or cilantro). For me that is seriously bare bones (not counting the various bottled ingredients always in my pantry, like fish sauce and cider vinegar). 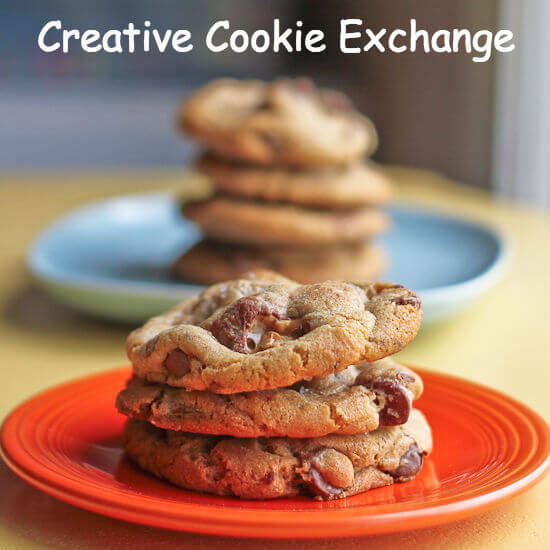 But they are all ingredients that pack some serious punch–and none of the ingredients are heavy or unhealthy, which is always a bonus after holiday partying has ended. Last, the dish itself comes together in moments, less than thirty minutes even if you are organized. I call for using small, slender sweet peppers because it adds that punch of sweet pepper flavor without any heat, which my older daughter cannot handle (but, exciting news! Sammy is becoming a bona fide chile head!). I then served the dish with Sriracha sauce on the side, which turned out to be the perfect complement anyway. But if you enjoy serious heat, feel free to use sweet and hot peppers or even all hot peppers. Just make sure they are long and slender so they may be sliced into rings. And if you are wondering? Yes Sammy had the Sriracha on hers. So exciting to have a kid enjoying spicy food! Heat the coconut oil in a large skillet over medium heat. I find nonstick easiest for seafood. Once the oil is melted, add the garlic and sauté for 1-2 minutes, stirring to prevent burning. Then add the sliced onion and continue sautéing for 5-7 minutes until softened. Add the fish sauce, lime juice, cider vinegar, agave syrup and red chile pepper paste. Stir and bring to a boil. Add the sliced pepper rings. Let cook for 2-3 minutes. Add the shrimp and let cook for 3-5 minutes until shrimp are turning pink and opaque, about 2 minutes. 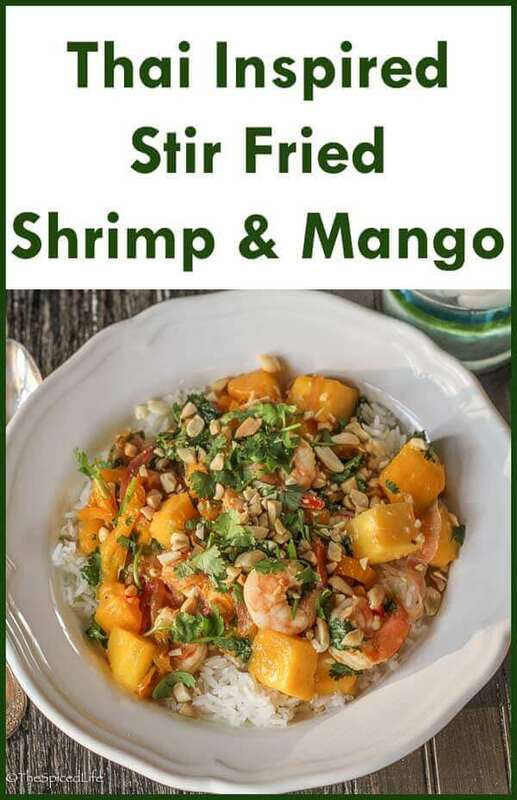 Add the mango, stir to incorporate and cook an additional minute or 2, until shrimp are cooked through and mango is heated. Serve with jasmine rice and garnish with chopped peanuts and cilantro or Thai basil. Drizzle with Sriracha for those like some kick.